Accordingly, the director kept his story traditional but his execution state-of-the-art. In the stunningly recreated 180AD Coliseum, only 2,000 of the 35,000 screaming extras were real – digital trickery took care of the rest. But this was CG magic anchored with salty realism, the emotional heft buttressed by blockbusting action scenes that had you tasting every spray of blood, staggering at every wallop. The Academy agreed (five Oscars, including Best Picture). So did the public ($457 million in worldwide box-office). Thumbs up. The epic lives. And how about that Aussie character-actor? 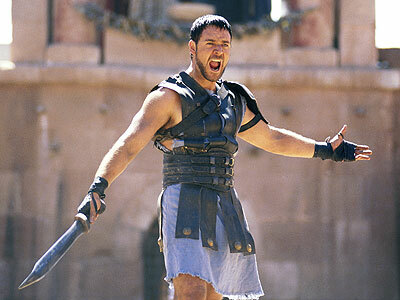 Before he became the general who became a slave who became a gladiator, Russell Crowe was many things. A bruising neo-Nazi (Romper Stomper), a hardboiled cop (LA Confidential), a doughy suit (The Insider)… A widely respected thesp, but definitely not blockbuster property. Well, that all changed. “I will give them something they have not seen before…” rumbled Crowe’s Maximus. And didn’t he just. Here was a throwback hero – brooding, hairy, insular and very, very, very hard. Women swooned. Their boyfriends flexed discreetly. Suddenly, men were men again. Suddenly, the 36-year-old Russell Crowe was A-list, a Hollywood star big enough to shoulder an entire movie. “I just thought Russell was part of a fresh, a new generation,” explains Scott. New generation is right, because this is a film studded with symbolic handovers – new eclipsing old. You can almost feel the tectonic shudder as the tremulous Joaquin Phoenix literally wrestles the mantle from Richard Harris’ Caesar. Perhaps even more prophetic is Harris’ fellow veteran hellraiser Oliver Reed – digitally revived (albeit subtly) after passing away during filming. Did we say symbolic? My precioussss… Are you not entertained?